Courtland Lewis, MD, an orthopedic surgeon from the University of Connecticut, spent three weeks in Mansehra, Pakistan, where he worked in the Doctors Without Borders/Médecins Sans Frontières (MSF) field hospital. 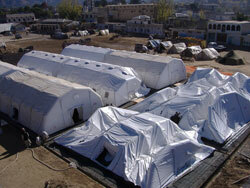 The field hospital, composed of nine inflatable tents, serves as the main orthopedic referral center for the wounded in Mansehra district in Pakistan's North-West Frontier Province. The hospital, which also houses four operating rooms, an intensive care unit, and an emergency room, has carried out more than 500 surgical interventions since opening on November 24. There are also 5 hospital wards with a capacity of 90 beds. A total of 750 patients are currently receiving physiotherapy treatment in the hospital and in three "medical villages" inside Mansehra town for patients who no longer require hospitalization and who cannot go back home, but still require medical follow up. Dr. Lewis talks about his experience working in the MSF field hospital. I left for Pakistan on December 8, 2005, joined by Salahuddin an anesthesiologist from Las Vegas. It took three days to get to Mansehra where we found the MSF team taking its first day off in six weeks. Although frustrating, given our enthusiasm to get to work, the day became an opportunity to put the whole trip into perspective as five members of the team traveled to Balakot, one of the hardest-hit towns. It created an unforgettable impression. We drove into the mountains north of Mansehra, where occasional small tent villages caught our attention. Traveling over the pass and into the river valley, we first saw cracks in buildings, then collapsed walls and houses; large tent complexes replaced whole villages. As we drove into Balakot, we were shocked by the complete devastation of the town. As one of the colorful Pakistani trucks passed us, my colleague Salahuddin (who speaks Urdu), turned to me and said, "That truck had a saying on it: 'The world is made of glass; people are made of stone.'" Upon entering Balakot, there was a tremendous cloud of dust generated largely by workers breaking the concrete with sledgehammers to retrieve the steel rebar reinforcement rods. It was almost surreal to simultaneously see people dealing with the devastation while getting on with their lives... selling fruit by the roadside, giving a haircut in a barber's chair perched in the ruins, loading their trucks. Their resilience was remarkable, doing what they needed to survive and rebuild their lives. Truly, I had the sense that the world is made of glass and people are made of stone. I started working in the hospital the next day. From an orthopedic perspective, this was phase two of the emergency–phase one being the initial triage and treatment of thousands of injuries. By two months out from the earthquake, a certain percentage of these fractures had become infected or were not healing properly and virtually all injured patients required rehabilitation–just as one would expect from high-energy trauma injuries in New York or Paris. 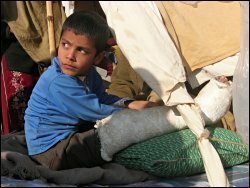 There were 88 beds in the field hospital. On any given day, between 55 and 75 beds were filled with orthopedic patients (and their designated family member), most of whom were earthquake victims. The orthopedic operating rooms were where the action was. 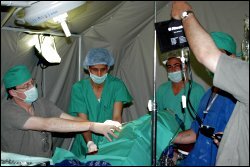 I operated with the MSF team, which included international and Pakistani staff, for 6 or 7 hours a day, performing between 8 and 18 procedures; these included cleaning up infected wounds, taking cultures, doing skin grafts, and occasionally, performing amputations. We created long-term treatment plans for 25 to 30 patients who had really complex problems and needed some continuity in their care. It will take six months to a year or more, in some of these instances, for the patients to heal their fractures. In the afternoon, I spent an hour or two examining patients the assessment team had brought back to the hospital from outlying areas: these were patients who may have needed casts removed, needed further surgery or most often, required physical therapy to regain function. It would then take three or four hours to round in the hospital with Cathy Pappin, the MSF hospital nurse, and her translator, Waqar. The quality of care they provided and their dedication to their patients were truly inspiring. The sheer number of people injured was amazing. You could have half a dozen orthopedic surgeons working their entire careers in the Mansehra district hospital to care for the long-term problems related to earthquake injuries–fractures that didn't heal right, arthritis because of fractures into joints, contractures of the affected joints. The level of resources available in Mansehra, provided by the Ministry of Health, will just not be adequate to do that. But to be honest, if that many thousands of people were all hurt at the same time in the United States, it would overwhelm us too. The long-term needs are difficult to fathom, just as those for immediate shelter and health care seem right now. The patients with the most acute orthopedic needs today are those who require physical therapy. By six, eight, or ten weeks after major orthopedic injury, most bones are healed but the joints on either side of the bones and the muscles going across the joints need rehabilitation; physical therapists and trained therapy aides are available in very limited numbers and one can see they will be overwhelmed in the next several, all important months. There were very interesting patterns of injuries. For example, if you're driving in a car and somebody hits you from the side, it compresses your pelvis, creating a characteristic injury called a lateral compression fracture. One might see one or two of those a year in most American orthopedic practices. I probably saw 25 or 30 during my short stay in Mansehra. These were people who were lying down, taking a rest, when the ceiling or wall fell on them and crushed their pelvises. Elbow injuries in young children were typical, potentially affecting their growth plates and causing permanent damage. There were many, many open fractures of the long bones which, not too long ago, would have been limb or even life-threatening injuries even in the US and Europe due to serious infection. What struck me early on was that every person I saw was in the same stage of orthopedic recovery since all their injuries happened within a few seconds of each other. You didn't have to take a medical history–everybody got hurt in the morning of October 8. The biggest problem for many of the injured people–and this is true anywhere and at anytime with orthopedic conditions–was the manifestation of psychological stress as physical pain. Anxiety and depression only make an orthopedic problem worse. I see this every day in my practice at home. It is difficult to imagine the stress level for a person who is trying to recover from a serious injury while at the same time, cope with the fact that half the people in their town died instantly, a number of them likely family members. To learn more about the hospital where Courtland worked you can watch a web video. Beyond the tent hospital, beyond the amazing efforts by international and Pakistani health teams working together, beyond the logistical support for shelter, food, and health care is the long-term challenge of making rehabilitation available to vast numbers of people who sustained physical and psychological injuries in the earthquake. I have personally been overwhelmed by the interest and support of family, friends and co-workers. I'm awed by the dedication of MSF staff and volunteers in New York, Islamabad and Mansehra. Perhaps, most of all, I am honored to have received the hospitality and trust of so many Pakistanis of Mansehra District who have taught me much about the human spirit through their suffering and their will to recover from unimaginable loss.